This time Furniture Cart team gives you the brief guidelines and tips about the types of sectionals. Just in case. In case you are starting making baby steps in the furniture rearrangements. Or if you are making renovation with a completely new home décor and you still want to provide seating for the whole crew. For a start, choose the best layout option for your room, whether it can be l-shape, chaise, symmetrical or other, it will become a fav place for a chit-chat, social talk or enjoying TV show. To get the whole guide please visit our blog. 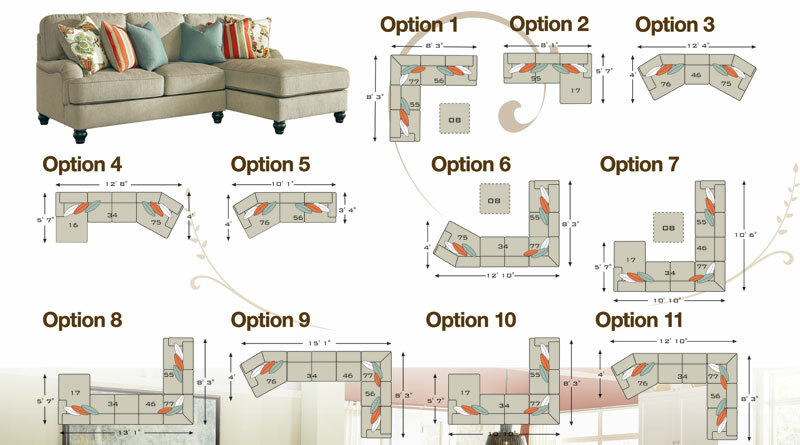 Wonder how to arrange the Kerridon Putty Modular Sectional by BenchCraft in your room? With our visual guide it would be easier to plan your space. The collection consists of 10 pieces that can be arranged in at least 11 ways! The Kerridon is designed with adaptive configuration options, it can be arranged as small or large sectional, with either chaise or cuddler. A breath of fresh air, Kerridon’s brightly colored accents bring beige to life. Polyester upholstery covers sturdy frames. Exposed feet with faux wood finish. Curvy Charles of London arms stand out against the clean, straight lines. Corner chaise, loveseat, armless chair, cuddler and wedge include decorative pillows with feather inserts and hidden zippers. UltraPlush loose seat cushions remain loftier longer thanks to two layers of cushioned comfort: high-density foam core encased in thick polyfill. Accent chair has a colorful Jacobean-print upholstery and tapered legs. Ottoman has storage beneath the removable seat. UltraPlush Cushions are constructed of high density foam cushion cores encased in a pocketed poly/cotton blend jacket for increased comfort. Style features Small Toss Pillows with Feather Inserts and Large Toss Pillows with Blended Feather Insert. All pillows have Hidden Zippers. Frame constructions have been rigorously tested to simulate the home and transportation environments for improved durability. Corners are glued, blocked and stapled. Seats and back spring rails are cut from 7/8″ hardwood. Stripes and patterns are match cut. All fabrics are pre-approved for wearability and durability against AHFA standards. Compliment this sectional with occasional tables such as Tallenfield (T744) or Roddinton (T861) Collections by Ashley Furniture for a complete look. If you have purchased this collection or any other furnishing from FurnitureCart let other shoppers know about your experience! Post a Product Review on FurnitureCart.com Reviews Page! Wonder how to arrange the Lonsdale Barley Modular Sectional by BenchCraft in your room? 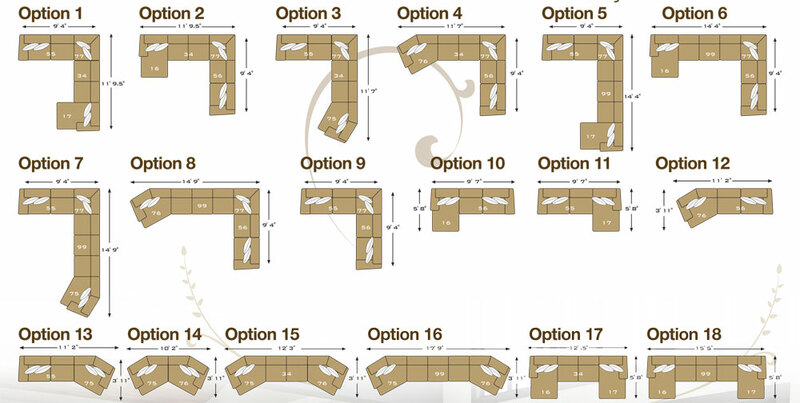 With our visual guide it would be easier to plan your space. The collection consists of 10 pieces that can be arranged in at least 18 ways! The best part of the Lonsdale is that it have been designed as modular sectional with adaptive configuration options, fitting into any living room with ample comfortable seating for everyone. Style features flared arms and welting details along with reversible cushions constructed of multiple layers of high quality foam wrapped with low melt fiber. Frame constructions have been rigorously tested to simulate the home and transportation environments for improved durability. Corners are glued, blocked and stapled. Compliment this sectional with occasional tables such as Dinelli (T801) or Marion (T477) Collections by Signature Design for a complete look, or browse within FurnitureCart catalog, to find endless materials, finishes, and options that will help you tap into the lifestyle you’re seeking. Take a seat and feel the comfort of Fairplay DuraBlend Mahogany Sectional by Ashley Furniture that provides affordable luxury at an economical price. The sleek contemporary design features comfort and style that fit within any living room decor. Rich finished tapered feet and detailed stitching enhance the beauty and comfort of your home. Plus, plush pillow backs and supporting seating cushions ensure the relaxation for the whole body. Durablend is an exclusive trademarked brand for Ashley Furniture and consists of blended leather or particles of leather adhered together with a coating of polyurethane. Contents: 17% Leather, 57% Polyurethane and 26% Poly/Cotton. It provides the look and feel of 100% Leather or Leather Match at an affordable price. Compliment it with occasional tables, lamps, rugs or wall art for a complete look. Also, don’t forget to check Top 10 inspiring ideas at FurnitureCart. Despite the fact the Hobokin Living Room Sectional by Ashley Furniture consist only of three modular pieces: oversized accent ottoman, armless chair and corner chair, the configurations options it offers – are unlimited. Plus, the two-tone contemporary style and soft upholstery fabric, surrounding the tufted seats and backs, bring fashion and comfort to your home. The UltraPlush Comfort Seating offers ultimate comfort and support. Individually pocketed cushion jackets with conjugated fiber sewn pockets for even fiber distribution create luxurious plush seating. The 2.0 High Resiliency cushion core retains support, provides extended durability and better rebound properties. In addition, the Hobokin is made with TB117 flame retardant foam. Compliment this contemporary sectional with Kishore T594 or Larimer T654 Occasional Table Collections, or other accent tables for perfect coffee time. Get more ideas from FurnitureCart’s Top 10 favorite sectionals or our online catalog to find more options. If you have purchased any sectional from FurnitureCart let other shoppers know about your experience! Post a Product Review on FurnitureCart.com Reviews Page! Bring an utmost comfort in your living room with the Comfort Commandor – Chocolate Collection by BenchCraft by Ashley Furniture available at FurnitureCart. This elegant modern sectional with ample seating and reclining loveseats is perfect for relaxing, entertaining quests and spending time with family. Plus, the Queen Sofa Sleeper lets your guests staying overnight. The sectional comes in Chocolate and Mocha colors with a convenient Touch Motion or manual reclining mechanism. Thick padded arms and deeply divided back cushioning for plush lumbar support make the sectional very cozy and comfortable. With built-in lights, cup holders and USB port you can enjoy reading an interesting book with a cup of fragrant coffee and charge gadgets. The Queen 5 Inch Memory Foam Mattress allows to have a good rest and has a beneficial effect on the spine. Compliment this contemporary sectional with Birnala (T656) or Wislyn (T717) Occasional Table Collections or other accent tables for perfect coffee time. For other living room furniture and sectionals, browse the FurnitureCart’s Top 10 favorite sectionals or our online catalog to find more options.